“Middle Horizon” is a period in Peruvian prehistory (Figure 37.1), but cultural dynamics embraced an area much larger than Peru (Figure 37.2). 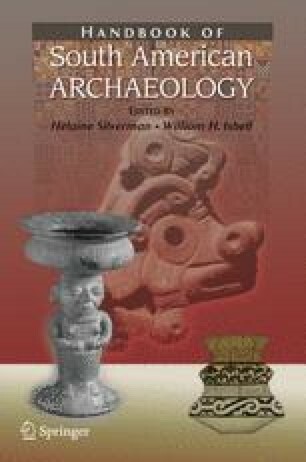 The Middle Horizon was the time when leadership in complexity within the Central Andes shifted from northern Peru and the Pacific coast – especially the spectacular Moche culture (see Chapter 36 in this volume) – to south central Peru, northwestern Bolivia and the Andean highlands (Figure 37.1). A new religious art spread through the Andes, composed of three primary supernatural images. From new urban capitals in central highland Peru and Lake Titicaca Bolivia, the distinctive religious icons diagnostic of the Middle Horizon reached the northern Peruvian mountains and coast. In the south they dispersed through the highlands, reaching southern Bolivia and the eastern valleys that descend to tropical forests – among them, Cochabamba with its immense mounds and idyllic conditions for maize agriculture. Northern Chile, at least as far south as San Pedro de Atacama, participated in this great interaction sphere, as did northwestern Argentina’s La Aguada cultural style (see Chapter 30 in this volume; Figures 30.5, 30.6). Janusek, John W., Arik T. Ohnstad, and Andrew P. Roddick, 2003, Khonkho Wankane and the rise of Tiwanaku. Antiquity 77 (http://antiquity.ac.uk/ProjGall/janusek/janusek.html).